BMW started producing their 5-series executive class sedan way back in 1972, but it wasn't until 1991 that they added the wagon version, which they called the touring. And if you ask certain minimalist dudes/ladies around the world they will claim that the 90s BMWs offered the best combination of simplicity, usability, and non-computer aided driving experience. 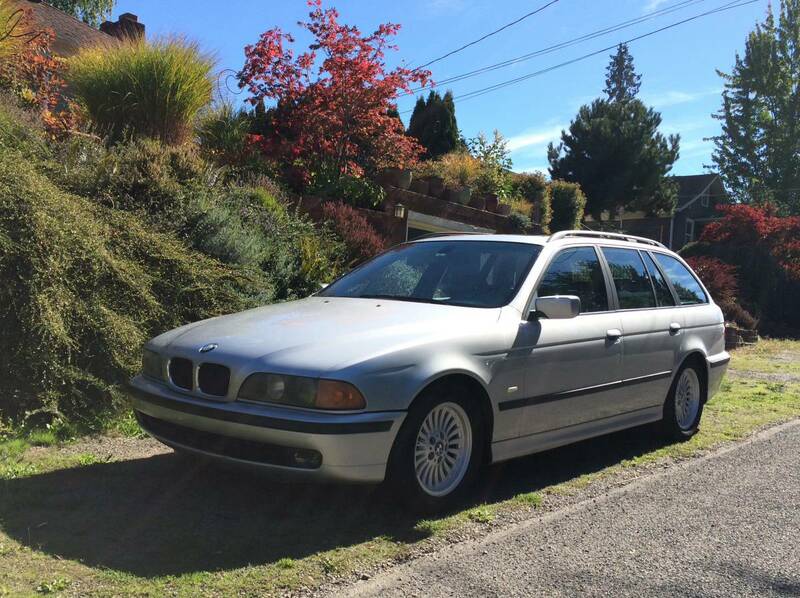 Find this 1999 BMW 528i Touring offered for $2700 in Crown Hill, WA via craigslist. Tip from FuelTruck. 1999 BMW 528i Sportwagen, titansilber with grey Dakota leather. 5 speed mt, premium, sport and winter packages, basically everything except navigation and the slide out loading deck. I flew to Kansas to buy it in 2003 as it was the lowest mileage manual transmission available in the US. It was serviced at BMW Seattle until the warranty expiration at 50k and at independent BMW shops since. We have spent approximately 12k on maintenance and service over the years. Currently has 152k miles, fairly low mileage for the year. -Runs great and doesn't burn oil. -Recent maintenance includes new front brakes and rotors, new battery, complete replacement of the cooling system, water pump with metal impeller, radiator, hoses, expansion tank etc. -Recent detail, interior is in excellent shape. -Rear gate doesn't latch completely so it rattles. -Needs valve cover gasket as there's some oil leakage onto the exhaust manifold, this should be addressed right away. -Headlights are foggy and auto height adjustment doesn't work. Bulbs are fairly new. -Clutch needs to be bled. -Front shocks are due at this mileage, they were replaced at about 80k as I recall. -This has been our family car for 14 years. Road trips, kids, dog, etc. While it has been well looked after until recently it is a city car and has suffered a few parking lot dings and indignities, all easily visible in the pics. All panels and glass are all original with the exception of the windshield which has been replaced. Tailgate was repainted by in 2001 by the previous owner due to a scratch from a shopping cart. -Deferred maintenance as listed above. Car has been infrequently driven over the last year and a half and will need some TLC to get it back into solid shape. Priced at $2700 firm due to the work required. It's a very solid car overall and with some time and effort I'd expect the new owner would be able to get at least another 75k out of it. She has served us quite well, now it's your turn. No brokers please, I don't need any help selling the car. Please email with any questions, typical CL ploys cheerfully ignored. We're in Crown Hill/ Ballard area. Former BMW owner here: RUN...AWAY...QUICK... after five Beemers and tens of thousands of dollars in repairs, i am cured of my German car addiction. As the BMW club blog would say, "Plan to spend $3,500 to $4,000 per year on maintenance and repairs." This car is worth maybe $5,000 in MINT condition, but since it has needs and body damage, you're talking at last $5K in work needed, which explains why he let the registration expire and isn't driving it. There is no such thing as "just needs a little work" when it comes to BMW vehicles. Current BMW beater addict here. (3 E28s, one 2002, one E32, one E86, and one E36 compact I got for free and don't know what to do with, and this is only the list I own today). Maybe don't run away if you turn your own wrenches. A valve cover gasket is $15 on Rockauto and is a one or two beer job assuming you've got the mechanical acumen to change oil. The clutch probably needs either a master or a slave cylinder, which are $55 and $30 respectively on Rockauto for the cheapest options. They're a bit more difficult to change, and it's much easier to bleed if you have a tool that can reverse bleed them. I'd call this a 3-6 beer job depending on your skill level or if you have a helper. It's easy to get frustrated doing these, I recommend experienced help, or the tenacity to keep working when it seems bleak. If you change those and it turns out the clutch itself is bad, you can get a clutch kit for a whopping $115 (thanks Rock) and while it's not an insigificant job to change, it's entirely DIY-able. Shocks don't come due because of mileage. They come due because they're blown and they don't work properly. You'll find this out on the test drive. Even if you've never driven a BMW you will know if it's not right. Even station wagon BMWs blow your Mitsubishi out of the water, if it doesn't handle like god's chariot, figure you've got some work to do and some money to spend. You can go and replace parts piecemeal, depending on what's worn and what's not. I personally would drop a grand (+/- 50%) rebuilding everything or close to it. Control arm bushings are a PITA to replace, when the whole control arm is available for not much more. They do wear out, much to the chagrin of cheapskates and non-car people. A whole suspension refresh is a weekend job. Stock the beer-fridge, order some pizza, get a couple buds to help you out and you can have it handling like new in a day. Given that it's a driver as it sits, I wouldn't make this a huge priority till the handling annoyed me sufficiently. It doesn't need to drive like a dream to get you down the road. Headlights are a tougher call. If you can see ok at night, there's not a ton of ROI in fixing them. I personally would try polishing them, and just accept the fact that the autoleveling is busted. I'd keep an eye out on forums, or u-pull lots to see if they had a cheap set for sale, but I would try to save cash here. This is an easy compromise to live with, if you want a concours level car, spend more cash up front, and buy something more interesting than an E39 wagon in the first place. I'd fix the rear hatch. Chances are you only need to re-align the latch or something fairly simple. Worst case, I'd get a new one from a u-pull lot. More issues will pop up, either on the test drive or later on. I'm sure the radio display has some missing pixels, and the cupholders might be broken (they all do both those things, they're easy to live with). Jeff is probably right that this thing needs more than it appears from the ad, but the only way you're going to be spending $3500-4000 a year on a BMW is if you pay the majority of that for somebody else's labor. Or if you have a track addiction, and a heavily modified car with expensive tires and brakes (I'm very guilty of that, but I don't think I've reached his estimate for maintenance even across my entire fleet (mods are another story completely)). I understand most of this all goes out the window if you don't have the skills, time, or place to do your own work on a car. (I didn't include tools in that list, you can nearly always buy those for less than the cost of labor, even specialist tools). I probably wouldn't buy this car. It's a little pricey for a beater I'm not in love with. Talk him down to about a grand and things might change, but as it sits it's not really on my radar. I've bought cars that needed more and less work than this for both more and less money, but this one doesn't speak to me. Buying an old junker and dumping money and effort into it is never worth it from a financial standpoint unless it either serves a practical need for a(n ongoing) price you're willing to live with or it makes your heart sing. I bought my E32 at the beginning of the year from a buddy whose wife placed a firm limit on the number of cars he was allowed to own. I think I paid about a grand for the thing. It's a gray-market import, so it's an '86 production 735i with no sunroof, a manual transmission, limited slip diff, no airbag, cloth manual adjustment seats and a massive 91L fuel tank with no flapper in the fill neck (It means you can almost use the terrible california gas cans without spilling everywhere). I've been driving it since the late summer, and so far all I've had to do to it is replace a window, tail light bulbs, charge the battery (sitting February till August will have that effect) and put gas into it. The interior isn't the best, the clearcoat is faded, the power mirror only works on one side, the central locking works everywhere but the passenger front (3 out of 4 ain't bad) and there's some dings and rust, but I've got next to nothing into this car and it drives solidly. I might buy snow tires for it and change the oil pretty soon, but this cheap beater is doing me right so far. Sorry for the novella, I just get annoyed when people say "AIN'T NOBODY CAN AFFORD A BMW"
This basic car (with automatic, as that's what I could find when my previous car got wiped out) is my daily driver. It's also done about 10,000 interstate miles with me, and you couldn't ask for a better cruiser. 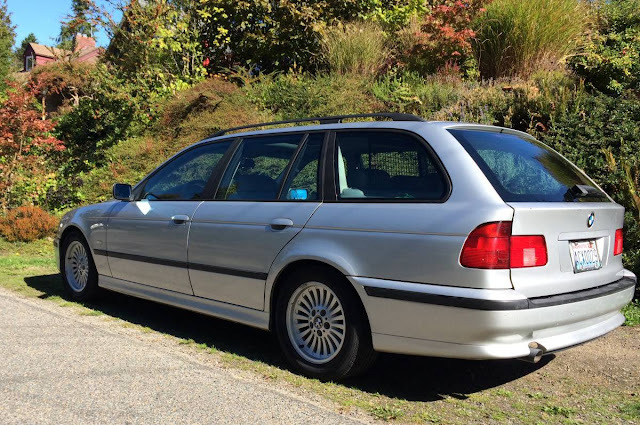 If you have only one spot to park a car in, you like to drive, and you have a dog, spouse, or hobby, the E39 touring is a good choice. If your space (or money, or whatever) is not so constrained, you may do better by dividing your functions (hauling, commuting, fun) over 2 or more vehicles. On upkeep I'd say the truth is between "it will break you" and "it's cheap with the internet and beer" (to unfairly summarize the foregoing). If the car is your daily, you'll spend more. If you live in a condo (minimum security prison), you'll spend more (although I saw a guy rebuilding a caliper on his E39 in a dark corner of our complex last spring). No matter what, there will be things you don't want to do (in my case, rear subframe mounts) or you can't do (air spring replacement, on I-70?). There will be BMW-only problems (why does it cost more than $30 to replace the gas struts on the tailgate, and why do no other cars always want to leak oil and power steering fluid?). "... if you ask certain minimalist dudes/ladies around the world ..."
Oh, you don't even have to ask me, I'll tell you. I, for one, do NOT welcome our new AI overlords, mediating our interactions, taking away the feel of the road, the physical connection to the engine, the grease under our fing... fzzzztzztz... woo, bit of a dizzy spell there. Ach, well, off to load balance the hyperdrive motivators on the i8.